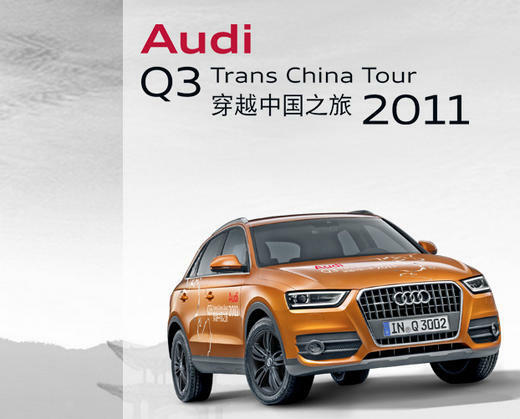 The Audi Q3 Trans China Tour 2011 starts tomorrow in Beijing. At the wheel of the new Audi Q3, the roughly 160 participants will get an intense experience of the country that has become the most important sales market for the Ingolstadt-based carmaker. During 16 stages and a route covering a total of about 5,700 kilometers, the participants will experience the dependability of the new Audi Q3 in every situation, from driving through the dynamic metropolitan centers to the off-road drives through spectacular mountain landscapes. The Audi Q3 Trans China Tour presents the rich and fascinating world that is China. It leads through the booming megacities of Beijing, Shanghai and Hong Kong, as well as through the surroundings of Shenzhen with its enormous concentration of large-scale industrial companies. It also leads time and again through the countryside, and often through singular landscapes like the Karst mountain range at Guilin. China has meanwhile become the most important sales market for the Audi brand; around 300,000 units are targeted for the current year. Four groups of participants will divide the entire route among themselves, with each group driving for four days. The first group will drive south from Beijing to Shanghai, and the second will drive on from there to Shenzhen. The destination for the third group is the city of Guilin, and the fourth group will ultimately arrive at the final stop of the tour in Hong Kong.